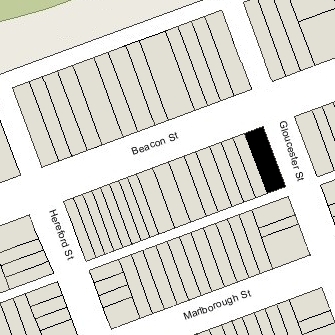 401 Beacon is located on the SW corner of Beacon and Gloucester, with 1 Gloucester to the east, across Gloucester, 403 Beacon to the west, 404 Beacon (2 Gloucester) to the north, across Beacon, and 4 Gloucester to the south, across Alley 415. 401 Beacon was designed by Eisenberg and Feer, architects, and built in 1927 as a five-unit apartment house, for William I. Schell, trustee of the Schell Realty Trust. He is shown as the owner on the original building permit, dated April 21, 1927. Click here for an index to the deeds for 401 Beacon. William Schell had acquired the property on April 15, 1927. That same month, he applied for (and subsequently received) permission to raze the existing townhouse. William Schell was a lawyer and assistant district attorney. He and his wife, Evelyn L. (Shapira) Schell, lived at The Kenmore at 496 Commonwealth. On February 1, 1933, the Institution for Savings in Roxbury and its Vicinity foreclosed on its mortgage to William Schell and took possession of 401 Beacon. On July 31, 1935, 401 Beacon was acquired from the Insitution for Savings in Roxbury by Louis J. Binda. On the same day, it was acquired from Louis Binda by Alfred W. Douglass and Carleton Hunneman, trustees of the Limechest Real Estate Trust. On July 31, 1946, the Limechest Real Estate Trust transferred 401 Beacon back to Louis Binda, and on the same day, it was acquired from him by Frederick M. Roberts. On December 29, 1953, 401 Beacon was acquired from Frederick M. Roberts by the New England Land Company, and on the same day it was acquired from it by 401 Beacon Street, Inc., of which Frederick M. Roberts was the president. On October 30, 1964, 401 Beacon acquired from 401 Beacon Street, Inc., by Fred Podren. In December of 1964, he filed for (and subsequently received) permission to convert the property from six apartments into thirteen apartments. In December of 1964, he amended the application to add the construction of a nine room penthouse and increase the number of apartments to fourteen. The property changed hands and on July 31, 1970, was acquired by Eliot Warden Denault, Sr., trustee of the Cameron Realty Trust. He and his wife, Marcia (Bartlett) Denault lived in one of the apartments. He was a real estate investor and former executive of an oil storage company. Marcia Denault died in July of 1984 and Eliot Denault died in February of 1985. 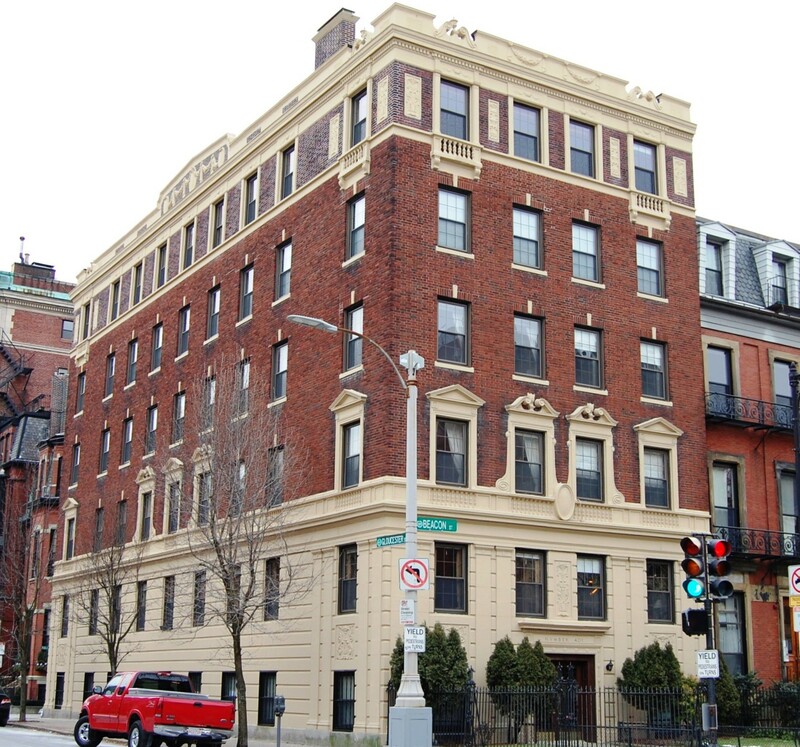 On July 16, 1986, Eliot W. Denault, Jr., Dorothy B. Denault (his wife), and Thomas P. Fulchino, as trustees under the will of Eliot W. Denault, converted the property into eight condominium units, the 401 Beacon Street Condominium. The Cameron Realty Trust continued to own all of the units. Eliot W. Denault, Jr., died in July of 2015 and on October 19, 2016, the Cameron Realty Trust transferred the property to his estate. On the same day, Dorothy B. Denault and Jonathan Wagner, trustees, sold 401 Beacon to 401 Beacon LLC (Peter E. Georgantas, manager). After acquiring the property, 401 Beacon LLC announced plans to remodel the building into five units. When it was built in 1927, 401 Beacon replaced an earlier townhouse designed by Snell and Gregerson, architects, and built ca. 1867, one of five contiguous houses (401-403-405-407-409 Beacon). James Gregerson, whose firm designed the houses, lived at 403 Beacon. In his Houses of Boston’s Back Bay, Bainbridge Bunting notes that 401-409 Beacon comprise “one of the most accomplished” integrated designs in the district, originally consisting of five houses, the three central houses (405-407-409 Beacon) forming a single unit and flanked by end pavilions at 401 Beacon (replaced in 1927) and 409 Beacon (modernized in 1947). The land on which 401-409 Beacon were built was purchased from the Boston Water Power Company on February 20, 1863, by banker and broker Robert Marion Pratt. 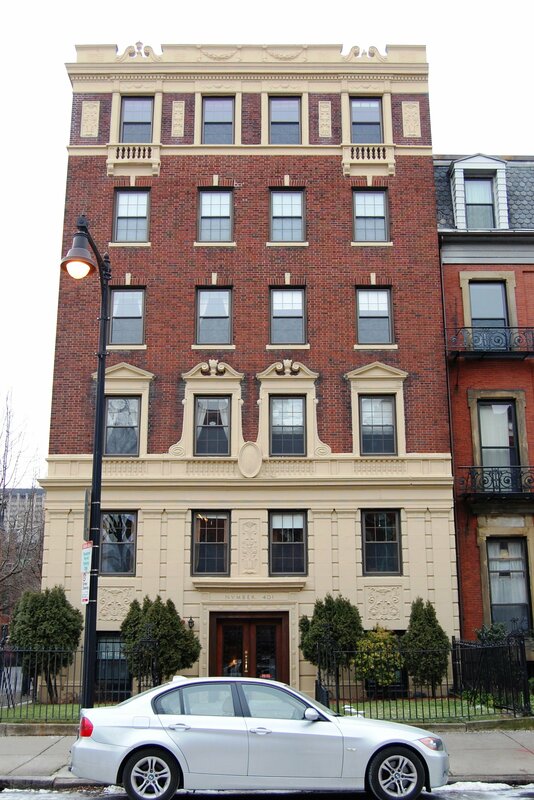 He was unmarried and lived at 13 Louisburg Square with his parents, George Williams Pratt (one of the founders of the Boston Stock Exchange) and Mary Barrow (White) Pratt. The Pratts also maintained a home, Oakley, on Belmont Avenue in Watertown (it became the Oakley Country Club in 1898). On May 30,1866, Robert Pratt sold the lot where 403 Beacon would be built to James Gregerson, and on September 18, 1866, he sold the lot where 405 Beacon would be built to artist William Morris Hunt. He retained the other three lots until after the houses were built. Click here for an index to the deeds for 401 Beacon (Demolished). On April 24, 1868, 401 Beacon was purchased from Robert Pratt by his unmarried aunt, Mary Pratt. She purchased 409 Beacon on the same day. She lived at 85 Mt. Vernon and at Oakley in Watertown, and purchased 401 and 409 Beacon as investments. On November 4, 1874, 401 Beacon was purchased from Mary Pratt by Josephine (Maralious) Andrews, the wife of Charles H. Andrews. They previously had lived at 108 Charles Street. Charles Andrews was a partner in R. M. Pulsifer & Company, owners of the Boston Herald. He sold his interests and retired in 1888. Charles and Josephine Andrews’ four children lived with them: Charles S. Andrews, a journalist; Edward J. Andrews, a journalist; Blanche Andrews; and George H. Andrews, a broker. Edward Andrews married in January of 1887 to M. Elizabeth (Park) Andrews. After their marriage, they lived at 401 Beacon with his parents. Charles S. Andrews married in April of 1887 to Katherine (Kate) Henshaw Jackson. After their marriage, they moved to 381 Commonwealth. Josephine Andrews died in October of 1887. Charles Andrews continued to live at 401 Beacon. Edward and Elizabeth Andrews, Blanche Andrews, and George Andrews continued to live with him. Blanche Andrews married in November of 1892 to Harry S. Maffitt, a banker. After their marriage, they lived briefly at 401 Beacon with Charles Andrews, but then moved to live at 336 Dudley with his parents, James S. Maffitt, an actor, and Mary A. (Vetter) Maffitt. Blanche (Andrews) Maffitt died in October of 1893. George Andrews married in January of 1894 to Bessie Allen Pitman. After their marriage, they lived in Winthrop. Charles Andrews married again, in January of 1896, to Rosa (Wolf) Baer, the former wife of jeweler Nathan Baer. After their marriage, they lived at 401 Beacon with Edward and Elizabeth Andrews. Charles Andrews died in June of 1897. Rosa Andrews moved soon thereafter and married again, to George Edward Hale, a retired cigar store owner; by 1901, they lived at 350 Commonwealth with her son, Julius Baer. Edward and Elizabeth Andrews also moved; by 1900, they had separated and he was living in New York City. On May 31, 1898, 401 Beacon was purchased from the Andrews family by Miss Frances V. Emerson. Miss Emerson operated a private “school for young ladies” at 401 Beacon and also made it her home. Miss Elizabeth F. Thayer lived with her and was a teacher in the school (she is identified as Miss Emerson’s partner in the 1900 US Census). Miss Emerson and Miss Thayer previously had lived and operated a school at 18 Newbury. Miss Thayer moved to Arlington in about 1903 but continued to teach at the school. Miss Emerson continued to live and operate the school at 401 Beacon until about 1905, when she moved to The Abbotsford at 186 Commonwealth. In about 1905, 401 Beacon became the home of Miss Mary Elizabeth Church and Miss Miriam A. Bytel. Mary Church continued to operate a girls’ finishing school at 401 Beacon. Miss Bytel was a teacher in the school. Elizabeth Thayer also continued to teach there until her death in August of 1907. On August 1, 1907, Mary Church acquired 401 Beacon from Frances Emerson. Miss Bytel continued to live with Miss Church at 401 Beacon until about 1909. Miss Church continued to live at 401 Beacon during the 1916-1917 winter season, but moved thereafter and by the 1918-1919 season was living at 9 Lime Street. During the 1917-1918 winter season, 401 Beacon was the home of Mrs. Althea Emogene (Hyde) Andrew, the wife of John Andrew. She was principal of the Beacon School, a co-educational boarding and day school located at 1440 Beacon in Brookline. She may have been living at 401 Beacon while her husband was traveling or, possibly, serving in the military. By the 1918-1919 season, she had moved to the school in Brookline, where they continued to live in 1920. 401 Beacon was not listed in the 1919 Blue Book. By the 1919-1920 winter season, 401 Beacon was the home of Ernest Edmund Nutman, a cabinetmaker, and his wife, Phebe Elizabeth (Foster) Nutman. They previously had lived in Cambridge. They continued to live at 401 Beacon during the 1925-1926 winter season, but moved thereafter back to Cambridge. On February 10, 1927, 401 Beacon was acquired from Mary Church by Gladys T. Besarick. On April 15, 1927, it was acquired from her by William I. Schell, trustee, Schell Realty Trust. The house was razed later that month.